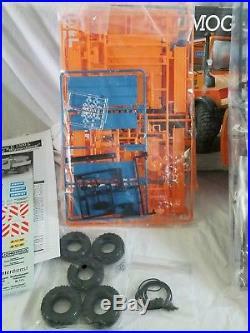 Lot of 2 Plastic Model Truck Kits of 1. 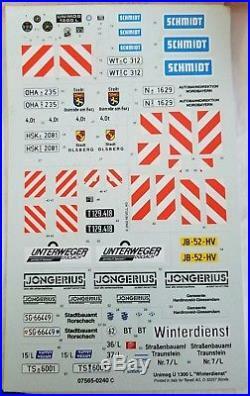 Revell kit #07565 1/24 scale Unimog U1300L Mercedes Truck Snow Plow. Kit is new in open box. All parts are sealed in manufactures bags. All parts appear to be present as with the instructions and decals. Some parts appear to come off the sprues but are still inside the bags. Its circa 2001 and the box looks to have some wear to the outer skin and bowing on the front but it's still intact. It's about 18yrs old so it's in decent condition for its age. 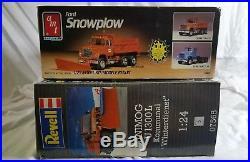 AMT/ERTL kit #6635 1/25 scale Ford Snow Plow "3 in 1" truck kit. Can be build 1 of 3 ways, as seen from the pics. This kit is new in open box. 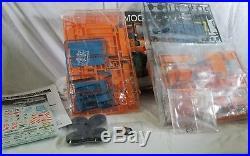 All parts are sealed in manufactures bags and all parts appear to be present as with the decals and instruction. Its circa 1985 and is in good condition considering it's over 30yrs old. There's bowing on the sides and some minor peeling to the outer skin but is overall intact and displays very nicely. 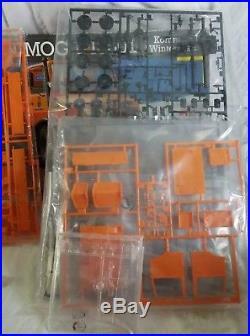 Both kits are unassembled and require full assembly using modelers glue and paint. Please look the pics over carefully and decide for yourself if they meet your expectations. My feedback is very important to me and I strive to maintain 100%. If a problem arises, please give me a chance to correct it. 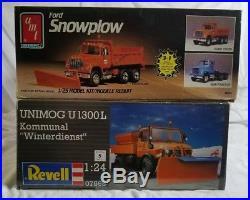 The item "Lot Of 2 Revell/AMT Unimog U1300L Snow PlowithFord Snowplow Model Kits" is in sale since Thursday, August 9, 2018. This item is in the category "Toys & Hobbies\Models & Kits\Automotive\Truck". The seller is "rickibobbyracer" and is located in Huntington Beach, California. This item can be shipped to United States, Canada, United Kingdom, Denmark, Romania, Slovakia, Bulgaria, Czech republic, Finland, Hungary, Latvia, Lithuania, Malta, Estonia, Australia, Greece, Portugal, Cyprus, Slovenia, Japan, China, Sweden, South Korea, Indonesia, Taiwan, Thailand, Belgium, France, Hong Kong, Ireland, Netherlands, Poland, Spain, Italy, Germany, Austria, Israel, Mexico, New Zealand, Philippines, Singapore, Switzerland, Norway, Saudi arabia, Ukraine, United arab emirates, Qatar, Kuwait, Bahrain, Croatia, Malaysia, Chile, Colombia, Costa rica, Dominican republic, Panama, Trinidad and tobago, Guatemala, El salvador, Honduras, Jamaica, Antigua and barbuda, Aruba, Belize, Dominica, Grenada, Saint kitts and nevis, Saint lucia, Montserrat, Turks and caicos islands, Barbados, Bangladesh, Bermuda, Brunei darussalam, Bolivia, Ecuador, Egypt, French guiana, Guernsey, Gibraltar, Guadeloupe, Iceland, Jersey, Jordan, Cambodia, Cayman islands, Liechtenstein, Sri lanka, Luxembourg, Monaco, Macao, Martinique, Maldives, Nicaragua, Oman, Pakistan, Paraguay, Reunion.